After New Jersey's Supreme Court victory last year, any state that wishes can legalize sports betting. At the same time various state lawmakers are considering sports betting legislation, Congress is too. Senators Chuck Schumer, D-N.Y., and now-retired Orrin Hatch, R-Utah, co-introduced comprehensive sports betting legislation at the end of 2018. On Sept. 27, 2018 the House Judiciary Committee held a formal hearing on the topic. To measure the change in the landscape, we ranked all 50 states and the District of Columbia in terms of how likely it is for each jurisdiction offer full scale legal sports betting. A brief synopsis for the active states is included, with updates to follow. Last updated on April 23, 2019. On June 5, 2018, Delaware moved to offer single-game betting on a number of different sports at three casinos in the state. Expanded sports wagering options could take place at additional locations or online. Delaware's authorization of what Gov. John Carney described as "a full-scale sports gaming operation" happened less than a month after the Supreme Court ruled that the federal law restricting single-game betting to Nevada was unconstitutional. Two casinos owned by MGM Resorts booked their first sports bets in Mississippi on Aug. 1, 2018. Mississippi enacted a new law in 2017 that allowed for sports betting pending a favorable decision by the Supreme Court. In June 2018, the Mississippi Gaming Commission adopted implementing regulations that require all betting to take place in-person, with mobile wagering to be considered later. On Aug. 30, 2018, West Virginia became the fifth state to offer legal and regulated sports betting when the Hollywood Casino -- a sportsbook owned by Penn National -- opened its doors. The move came six months after the West Virginia legislature passed a new bill with the West Virginia Lottery Commission serving as the chief regulator. Both in-person and online sports wagering are permitted under the law. On Oct. 16, 2018, the Santa Ana Star Casino & Hotel booked its first sports bet in partnership with Nevada-based USBookmaking. Although New Mexico has not passed any new sports betting legislation since the Supreme Court's decision, the move by the Santa Ana Star Casino & Hotel was made via a gaming compact with the state. According to Nedra Darling, spokeswoman at the Department of the Interior's Office of Indian Affairs -- the federal agency in Washington, DC that oversees tribal gaming compacts -- the New Mexico compacts permit "any or all forms of Class III Gaming," a category in the federal regulations that specifically includes "[a]ny sports betting and pari-mutuel wagering." 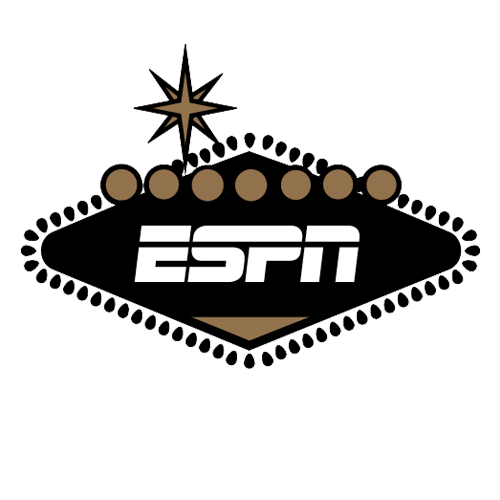 Published reports indicate that bets will not be permitted on games involving the University of New Mexico or New Mexico State University. The Hollywood Casino at Penn National Race Course booked the first legal sports bets in Pennsylvania in mid-November 2018. The move came just over a year after Gov. Tom Wolf signed a new sports betting bill as part of a broad legislation push that included online poker and DFS. The October 2017 bill became effective after the Supreme Court's May 2018 ruling upending the federal ban on single-game betting outside of Nevada. A number of other sportsbooks have also obtained a license to operate in Pennsylvania. In a June 15, 2018 letter to Pennsylvania officials, the NFL expressed concerns about consumer protections, data and enforcement issues under the bill. The Twin River Casino in Lincoln opened its doors for legal sports betting on Nov. 26, 2018. The move came five months after Gov. Gina Raimondo signed the state budget, which included language allowing sports betting. Only two locations would be allowed to offer sports betting under the law, with the state's lottery providing regulatory oversight. In early 2019, the law was tweaked to provide for mobile betting. In 2013, New York passed a law to allow sports betting at four on-site locations. After lying dormant, the law could be revived. The New York State Gaming Commission is aiming to complete regulations "in the short term" for the four locations specified in the 2013 law. Legislation that would have allowed for full-scale sports betting in New York failed in June 2018, but have been re-introduced in 2019. New York's long-running issue with fantasy sports perked up in late 2018 too. On October 26, Acting Supreme Court Justice Gerald W. Connolly ruled that the state's two-year-old DFS law violated the state's constitution. "The judge's decision was unequivocal," said Cornelius D. Murray, the lead attorney representing the plaintiffs in the case, in a statement to ESPN. "The ruling found that New York's DFS law was unconstitutional beyond a reasonable doubt." In the wake of the ruling -- which will likely be appealed by the state Attorney General -- both DraftKings and FanDuel confirmed that they will continue offering fantasy contests in the state. On Nov. 6, 2018, Arkansas voters approved 'Issue 4,' a constitutional amendment that will bring expanded gambling -- including sports betting -- to four counties in the state. Under the ballot measure, "accepting wagers on sporting events" was specifically included under the definition of permissible casino gaming. The Arkansas Racing Commission will oversee licensing at the four locations, a process that could take months. Retired Oklahoma Sooners and Dallas Cowboys coach Barry Switzer publicly supported the ballot measure. After enacting a scaled-down anticipatory law in 2017, Connecticut saw a comprehensive sports betting bill introduced during the first part of 2018. The state held hearings and received testimony from a variety of stakeholders, including representatives from the NBA and MLB. The state legislative session closed without a formal vote on the comprehensive bill. At the start of 2019, a new bill focused on "authorizing sports wagering" was introduced in Connecticut. In January 2018, a Senate bill called the "Sports Betting Consumer Protection Act" was introduced. The draft bill could "authorize sports betting or electronic sports betting by an electronic sports betting patron or sports betting facility patron." Illinois saw several other sports betting bills introduced in 2018, too. Hearings were held about the various bills, but no formal vote was taken. On June 25, 2017, Sen. Julian M. Carroll introduced a marked-up 27-page bill that would empower Kentucky's racing commission to "institute a system of sports wagering." The bill would allow betting on pro and college sports, but not high school or other adolescent amateur sports. It includes a hefty tax rate -- 3 percent of handle -- and an initial licensing fee of $250,000. The bill also permits sports league representatives to serve on the racing commission. Two additional bills were introduced during January 2019. In 2017, legislation was introduced to amend the state's current gaming control law. Michigan's proposed bill would allow any holder of a casino license to "accept wagers on sporting events." The state's gaming board would be required to "promulgate rules to regulate the conduct of sports betting under this act." The law was approved by Michigan's legislature, but the state's governor vetoed the measure. One version of a January 2018 bill introduced in Indiana would allocate a 1 percent "integrity fee" to specific sports leagues based on wagering handle. The bill also would require a 9.25 percent tax on sports betting-related revenue. Bill sponsor Alan Morrison -- a member of the Indiana House -- said the bill resulted after some input from the NBA and MLB. A different sports betting bill was introduced on the Senate side. The 2018 Indiana legislative session closed with no vote on either bill. However, a new bill was introduced in January 2019. In February 2018, the Massachusetts Gaming Commission released a comprehensive 31-page white paper to provide a "roadmap for those seeking to learn about the current landscape of the sports betting discussion in the country and its possibilities in Massachusetts." In January 2018, Senate bill 2273 was floated to study sports betting. A different bill to legalize and regulate sports betting was introduced November 2018. Massachusetts was one of the first jurisdictions to address the legality of daily fantasy sports and could conceivably move quickly on the sports betting front too. 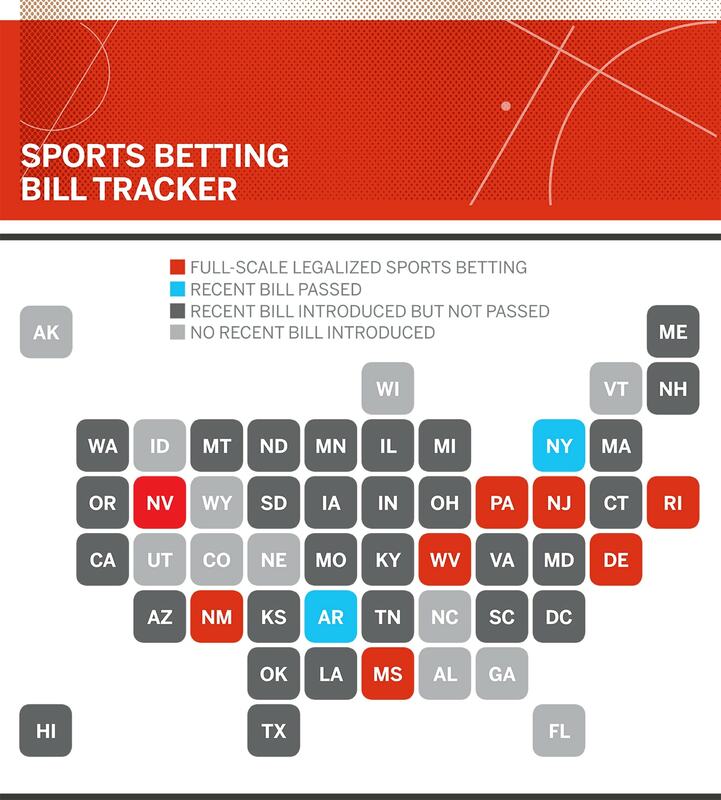 In January 2019, a number of sports betting legalization bills were introduced. Maryland House Bill No. 989 was introduced on Feb. 9, 2018 and calls for the establishment of a task force to "study the implementation of sports gaming in the state." The draft legislation includes the allocation of a "sports gaming license" and the ability to accept wagers on sporting events if the bettor is at least 21 years of age. The proposed Maryland legislation did not move forward in the 2018 legislative session. In January 2018, Rep. Bart Korman introduced a new bill that would have allowed already-licensed riverboat casinos and daily fantasy companies to expand their offerings to include traditional sports betting. Legislative hearings were held in Missouri prior to the Supreme Court's ruling, but the bill did not advance beyond the committee stage. In January 2019, a number of new sports betting bills were introduced. A proposed law "relating to sports gambling" was introduced January 2018. The bill would have expanded the purview of the Kansas lottery to sports betting involving "one or more competitive games in which amateur or professional athletes participate, or are intended to participate, or on one or more performances of such athletes in such games." Kansas held sports betting hearings in the months before the Supreme Court issued its decision, but took no action afterward. Another bill was introduced January 2019. Introduced in 2017, House Bill No. 3102 would have amended South Carolina's Constitution to allow "sports betting on professional sports." Any betting would have been "strictly" regulated and limited to "specified" areas. According to a court document from the now-resolved New York daily fantasy litigation involving DraftKings and FanDuel, South Carolina's current definition of gambling "includes betting money on the outcome of any 'game,' regardless of the skill involved in the game." The bill was not enacted prior to the close of the legislative session, but a new bill was introduced at the start of 2019. Oregon already has a law on the books permitting some forms of sports betting, and the law could be expanded in the future if lawmakers are so inclined. For years, Oregon was one of the small number of states exempted under PASPA because it offered sports betting before Congress intervened. For example, the Oregon Lottery offered a football-themed pick 'em-style game for years before mothballing it about a decade ago. In January 2019, a broader sports betting bill was formally introduced in the Oregon legislature. Like Oregon, Montana already has a law on the books allowing certain types of sports betting in the state. The Montana Lottery currently offers a fantasy-type sports pool for football and auto racing. If Montana lawmakers sought to expand its permissible sports betting offerings, they would probably need to enact a new law or empower the Montana Lottery to release new regulations. In early 2019, a new bill was introduced that would permit "sports pools" to be conducted in the state by licensed operators. On September 18, 2018, Councilmember Jack Evans formally introduced "The Sports Wagering Lottery Amendment Act of 2018." The purpose of the proposed legislation is to "legalize sports betting in the District of Columbia, while also creating strong regulatory structures that ensure consumer confidence." The bill would allow both online and in-person wagering, with the District Lottery in charge of regulatory oversight. On January 23, 2019, Mayor Muriel Bowser signed the bill, sending it to Congress for review and approval during a 60-day period. Tennessee saw a new sports betting bill introduced in November 2018. Titled the "Tennessee Sports Gaming Act," the bill would allow sports wagering if permitted via a local election. "After the bill is formally filed in early 2019, it will be assigned to a specific committee," said Representative Rick Staples, a member of the Tennessee General Assembly representing District 15 in the Knoxville area and the author of the bill. "A hearing and potential vote could follow after that." According to Rep. Staples, his bill has a July 1, 2019 effective date and most tax proceeds would go towards funding education programs in the state. Rep Staples told ESPN that the bill could be amended later to include an 'opt out' for colleges that request one. In the Commonwealth of Virginia, a comprehensive sports betting bill was introduced in November 2018. The bill -- called the "Virginia Lottery Law" -- will be considered during the 2019 legislative session. With oversight delegated to the Virginia Lottery, the bill would permit sports betting on a wide variety of events, but not any involving Virginia-based colleges or certain youth sports. The proposed legislation calls for a $250,000 permit fee and a tax rate equal to 15 percent of revenue. New Hampshire's 2019 legislative session opened with a new bill -- 480-FN -- introduced to establish a system "within the lottery commission for sports betting." The bill would not allow betting on any college sporting event in the state. If enacted, the bill would have a Jan. 1, 2020, effective date. Introduced in January 2019, House Bill 1254 would authorize "sports betting as a game of chance" in the state. Oversight of sports betting would be the responsibility of the North Dakota Attorney General. January 2019 included a flurry of legislative activity in Maine. Seven different sports betting legalization bills were filed during the month. One bill would potentially give Maine's Gambling Control Board regulatory control over sports betting. On Jan. 23, 2019, a trio of Arizona lawmakers introduced a new bill -- SB 1158 -- that would authorize federally recognized tribes with a gaming compact to "operate sports betting" in the state. The proposed law would prohibit others from offering sports betting. Under the bill, the definition of sports betting "does not include wagering on sporting events that is prohibited by the National Collegiate Athletic Association." House Bill No. 1107 was introduced in the Hawaii legislature in January 2019. According to the 21-page bill, "it is in the best interest of the State and its citizens to regulate this existing activity by authorizing and implementing a secure, responsible, and legal system for sports wagering." The proposed bill would create a "Hawaii sports wagering corporation" for regulatory purposes. On Jan. 25, 2019, over two dozen South Dakota lawmakers filed a joint resolution "[p]roposing and submitting to the voters an amendment to the Constitution of the State of South Dakota, providing for wagering on sporting events." If enacted, the potential constitutional amendment permitting sports betting could be on the ballot in 2020. On February 1, 2019, Representative Eddie Lucio III introduced a 15-page bill "relating to the regulation of sports betting." Sports betting operators in Texas would be required to obtain a permit and pay a $250,000 fee. The Texas Commission of Licensing and Regulation would oversee sports betting under the proposed law. The bill would also mandate that a 6.25 percent tax be "imposed on each bet placed by a sports bettor." Two sports betting bills were introduced in Washington during the first part of February 2019. House bill 1975 would authorize sports wagering "on a very limited basis by restricting it to tribal casinos in the state of Washington." The other proposed law -- House bill 1992 -- would permit sports betting only on-site at licensed horse racing tracks. Neither bill would permit mobile sports wagering throughout the state. In early 2019, a 12-page bill was introduced in Georgia "to provide for sports betting in this state." The bill would also establish a Georgia sports betting director position and "provide for the comprehensive regulation of sports betting and related activities." Under the bill, betting is allowed on professional and college sports, but not youth sports. No more than 10 "sports betting permits" are allowed under the draft legislation. Vermont legislator Thomas Burditt introduced an 18-page bill in February 2019 that "proposes to legalize sports wagering in Vermont." Mobile betting is permitted, but licensed operators must employ technological measures to ensure that all bettors are physically located within the state at the time any wager is made. Certain types of betting would be banned under the bill, including wagering on high school sports and esports. Betting on college games in Vermont or involving Vermont-based universities would also be prohibited. On March 7, 2019, four North Carolina lawmakers formally introduced House Bill 302 "to enable wagering on sporting events on tribal lands." Any sports betting would have to be in accordance with the underlying tribal-state gaming compact. Under the bill, wagers would be permitted on both professional and college sports. A group of seven lawmakers in Colorado introduced a new bill on April 18, 2019 that could bring sports betting to the state as early as 2020. The proposed law -- House Bill 19-1327 -- would create "a ballot measure authorizing the collection of a tax on the net proceeds of sports betting" and help fund the Colorado's water plan. The bill would decriminalize sports betting in the state and allow for the issuance of a "limited number" of licenses to offer sports wagering. In early April 2019, a 44-page bill was introduced in Alabama that would "permit wagering on certain professional or collegiate sports or athletic events and other events." Under the bill, a newly created 'Alabama Sports Wagering Commission' would oversee regulation of sports wagering in the state. The proposed law would levy a 10 percent tax on sports wagering receipts of licensed operators.